The other night I got a call from the ex saying that due to a hurricane that was wending its way up the east coast, he, his girlfriend, and her son needed to get away for a day for safety, so he decided to come to our house and see the kids. I never formally announced here at ECDS that we had split up; at the time things were confusing, stressful, and so much more, and I actually took almost a year off posting here. But yes, it’s been two and a half years, and he lives in a neighboring state, about seven hours away. The call to come here the next day, the day before the 4th of July, was out of the blue and spur of the moment, but hurricanes don’t exactly work according to your schedule. I wanted the kids to have this chance to see their father. Ryan and Timmy hadn’t seen him in over a year, and for Megan and Caitlin it had been two years. Yes, they talk on the phone all the time, but nothing can compare to a real time physical hug, and both Phil and I were determined to make this work. Of the day itself, there’s not really too much to tell; due to traffic and extenuating circumstances, they arrived later than planned, so the time was much too short. But everyone made the most of it, and if at first it was somewhat awkward, it turned into a relaxed night of people just enjoying the food and festivities so the kids could have these few hours with their father. 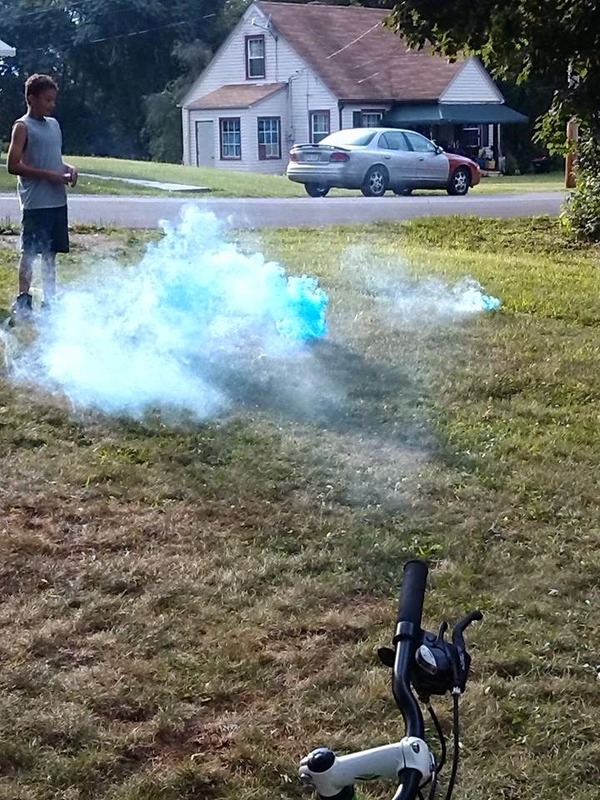 Caity had been stockpiling fireworks like she does every year since we moved to a state in which they’re legal, so she did some smoke bombs with the kids while they waited for Michael, Maryanne, and her son Robert. Then they arrived, and I couldn’t grab my camera quickly enough. We had kept this visit as a surprise for the kids, except for Caitlin, because I simply needed her help with cleaning and all. Megan shrieked, “Daddy!” Even Ryan and Timmy recognized the tenderness and solemnity of this moment. Bathrooms were used, drinks were gotten, and eventually we just sat eating and gabbing at the picnic table plus an extended table Caity bought. We ordered some deep dish pizzas from Little Ceasar’s to make things easier, and served soda, chips and dip, cheese puffs, etc. 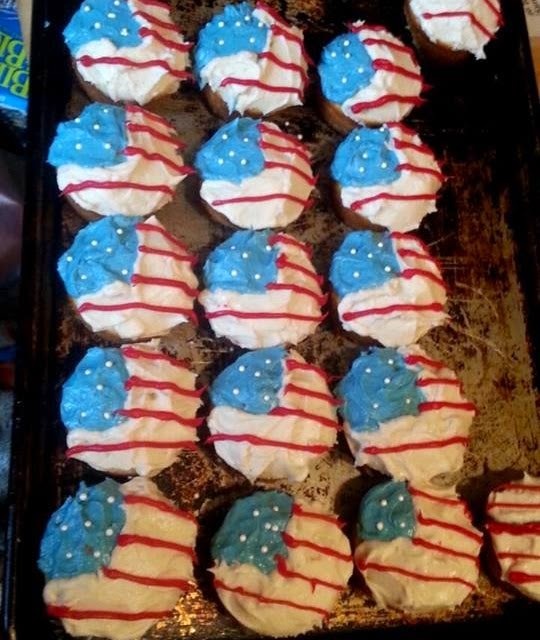 Fourth of July cupcakes that Caitlin made for the occasion. We were going to celebrate Independence Day that night anyway, as she had her 24 hour shift on the actual holiday. When I used the flash, you could see the people but the glow necklaces didn’t show up. After a wonderful display of fireworks put on by the Master of Ceremonies, Caitlin, we took photos of the kids with their dad so Michael, Maryanne, and Robert could go find a motel and get some sleep. It was 10:30 or 11 p.m. by then, and everyone was pretty much exhausted. Exhausted but happy…this special time was made possible for my children and their father because the adults put themselves aside for the night and made it work. A very precious memory my children will keep in their hearts.